This was delicious but I advise people to double the amount of bacon. While it’s really tasty you don’t get enough of a bacon flavour. Preheat oil in a pot, over medium heat. Peel and slice whole onion to create rings. Peel off the little, clear membrane that is in between the onion rings. In a medium mixing bowl whisk milk, bacon drippings, flour, baking powder, paprika and salt together until smooth. Crumble crispy bacon strips and then mince them as finely as possible with a knife. Add minced bacon bits into the batter and mix until evenly incorporated. 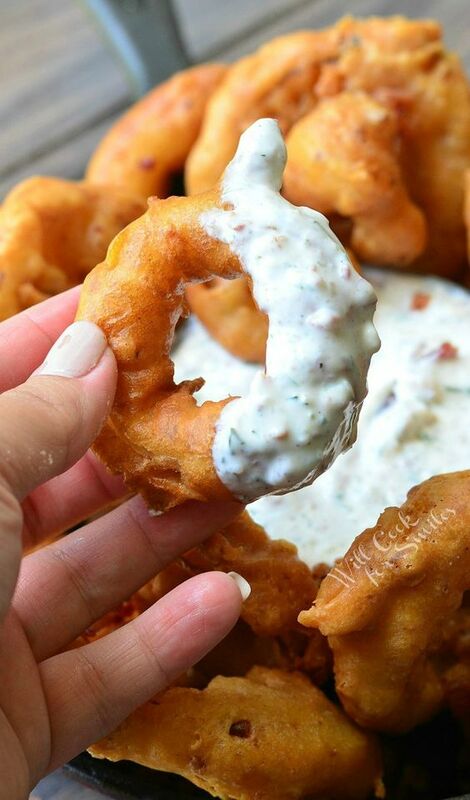 Dip a few onion rings into the batter, covering it completely, and gently add them to the heated oil, once at a time. Cook onion rings in batches until deep golden. You will want to cook over medium heat that way batter doesn't get dark too fast, leaving you with a raw onion inside. Cooking it on medium heat for a longer period of time will cook the onion inside. For dipping sauce: whisk all ingredients together in a small bowl, until all incorporated. Make sure to use the same method for mincing bacon as you did for onion rings.